"It's Morphin' time!" Lionsgate has debuted a second trailer for their new Power Rangers movie, directed by Dean Israelite (Project Almanac). This definitely looks like a lot like Chronicle with a bit of Iron Man, but instead of a billionaire engineer, we have five high school kids who end up gaining superpowers and stepping into colorful sci-fi suits. The cast is lead by: Naomi Scott as The Pink Ranger, Becky G. as The Yellow Ranger, Ludi Lin as The Black Ranger, RJ Cyler as The Blue Ranger, and Dacre Montgomery as The Red Ranger. Also starring Bryan Cranston as Zordon, Bill Hader as the voice of Alpha 5, Elizabeth Banks as Rita Repulsa, as well as David Denman, Sarah Grey, Emily Maddison, and Caroline Cave. This actually looks more entertaining than I was expecting, but I'm still not sure if it's going to be any good. You can still watch the first official teaser trailer for Power Rangers here, to see the original teaser footage. A group of high-school kids (played by Naomi Scott, Becky G., Ludi Lin, RJ Cyler, Dacre Montgomery), who are infused with unique superpowers, must harness their abilities in order to save the world from being obliterated by an alien threat. Chosen by destiny, our heroes quickly discover they are the only ones who can save the planet. 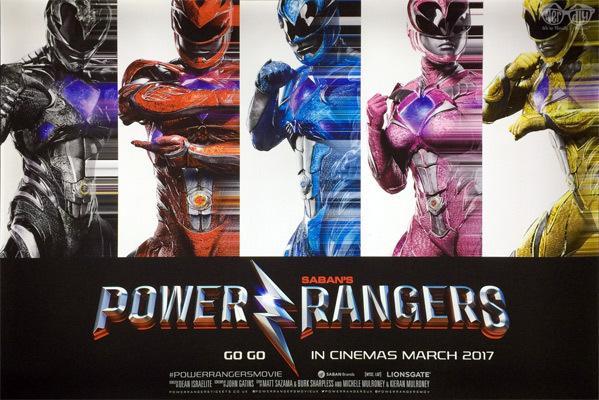 Saban's Power Rangers is directed by South African filmmaker Dean Israelite, who previously directed Project Almanac, but got his start as an assistant to director Jonathan Liebesman. The screenplay is written by John Gatins & Ashley Miller. Based on the TV series "Mighty Morphin Power Rangers" created by Haim Saban & Shuki Levy in 1993. Lionsgate will release the Power Rangers movie in theaters worldwide starting March 24th, 2017 this spring. Stay tuned for more. So who's excited for this? the weird thing is Bryan Cranston was the weakest part of the trailer...his line reading was awful. everything else looked okay. "...pee in that cup!!!"...lol! This seems to a "fun role" for Bryan. It's got a big gold statue in it, but won't win any. Good excuse to eat popcorn. Seems to be trying to capture the feel of the first Transformers movie, but I don't think it has managed to. I like how they are trying to hide dat green ranger. Wow...this...isn't AS a terrible as I originally anticipated. However, I'd rather have a Voltron movie than Power Rangers. LAME. At least, nobody is destroying some big city here, right? Is that budget Zac Efron? Is this going to work with the new generation or is just nostalgia for old people?